Re-envisioning an olive grove domain into a habitable rural park. a rural urbanity (rurbanity). The 30 hectares reconversion of an olive grove domain into a semi-rural/semi-urban vernacular habitable park is in the governorate of Manouba on a hill near the Medjerda river on the South West edge of Jedaida city limits. 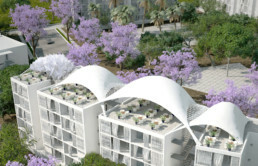 Its eco friendly planning design preserves and utilizes an existing olive grove estate, by placing small individual pavilions for collective housing and service facilities within its 4 475 existing salvaged olive trees and by planting tall sized trees plus a wild botanical garden for more local bio-diversity. The overall urban planning is centered around a green common which connects services and housing pavilions within the same network without the need of using roads. The rural park enables trees and rustic nature to flow freely throughout towards a communal park, or “commons”. This is surrounded by amenities in an organic relation which transforms the existing olive grove into a habitable park. This rural Agora includes housing (3200 units), administrative and health facilities, a cultural center, an elementary school, retailing, a sports area, a mosque, bus and taxi hub. This habitable park offers an alternative solution to nearby peri-urban growth. It establishes new strategic relations between man-nature-culture that are rarely addressed in green neighbourhoods (éco-quartier) but necessary to develop if we want to build more efficiently a sustainable environment. 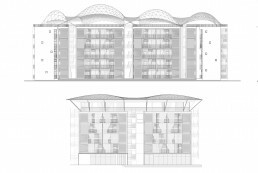 This hybrid architecture housing project is based on bio-climatic principles for a more sustainable environment. Design Team Philippe Barriere Collective Tn (PB+Co) : Vicky Tessier, Azza Mezghani, Aboudou Azize Olawolé Marcos, Ibrahim Tameur Abbassi, Tania Paula Garza, Lucie Riedweg, Yosri Boukadida, Wael Ben Mansour.